It may seem like an identity crisis, as if we Latinos/Hispanics can’t make up our minds about what to call ourselves. And it’s true. We can’t. It started many years ago, when Census Bureau officials determined that they needed a term to lump together all people of Spanish and Latin American origin. They settled on the term “Hispanic,” and a controversy was born. Although some Latinos were consulted on that decision, many others objected, noting that they preferred to be called Latinos and that they didn’t want government bureaucrats determining what they should be called. And thus for years, we've had a useless debate between those who want to be called Hispanics and those who want to be called Latinos. Those who prefer to be called "Hispanics" say their term recognizes the common language and Spanish roots that most Latin Americans share. Some say those who call themselves Latinos are denying their Spanish heritage. "Latinos" say their term recognizes their multi-ethnic and multi-racial background. Some say those who use "Hispanic" are ignoring their African and Indian roots and exaggerating their Spanish heritage. The controversy dates to the 1970s, when the government, corporate America, and the media began to call us "Hispanics," which had been a seldom-used term in this country — and then, only to describe things of Spanish origin, not Latin Americans. That's when the federal government, during preparations for the 1980 census, officially imposed the term "Hispanic" on the Latino community. Nevertheless, having one single term to lump all Spaniards and Latin Americans was very convenient for the media, the government, and Madison Avenue marketers who rushed to use the term blessed by the U.S. Census Bureau. It gave Latino politicians a license to speak for all Hispanics. It made it easier for advertisers to approach a very diverse community of many nationalities, cultures and histories with one single ad campaign. One Spanish-language TV network even commissioned a study that found a "blurring of differences" between U.S. Hispanics and concluded that "the marketer could consider all Hispanics in aggregate as [one] consumer segment." Those who oppose being called Hispanics say this could have been done with the word "Latinos," but at least it would have been a term we chose. If people finally came to understand that we should call African-Americans whatever they want to be called, and that women should be respected when they want to be addressed as Ms., many Latinos wonder why they can't get the same respect. To me, the term Latino always made much more sense. 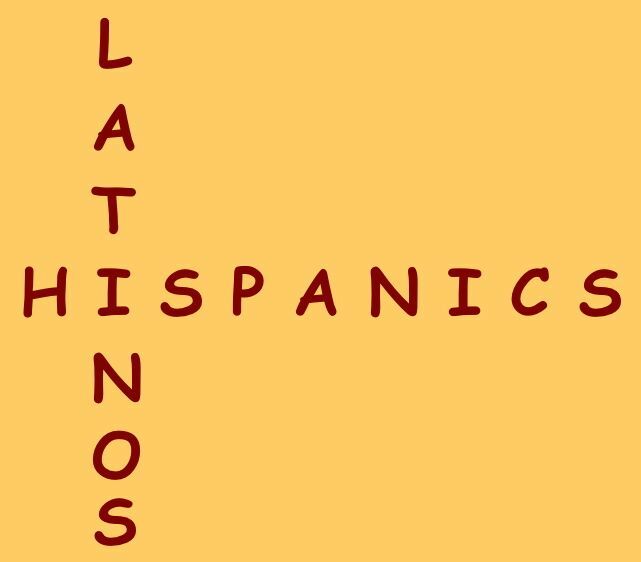 After all, in Spanish, we call ourselves “latinos,” the Spanish word for “Latins,” much more often than we call ourselves hispanos, the Spanish word for someone of Spanish origin. For most Latinos/Hispanics, the difference between the two terms is clear. But for other Americans, it may all seem quite confusing, especially since now they hear many people calling themselves both Latinos and Hispanics. “Why do you use ‘Latinos’ and ‘Hispanics’ interchangeably?” asked a reader who wrote me a letter. The answer is because I gave up fighting over semantics – because the long-standing debate has been generally accepted as a draw. When the Hispanics/Latinos debate began, I was one of those who preferred "Latinos." But over the years, I have come to accept the fact that "Hispanics" are here to stay. That term is now so engrained in our community that it would be impossible to replace. "Hispanic" is now part of the name of many Latino organizations and publications. Now we have a "Hispanic Congressional Caucus," and we celebrate "Hispanic Heritage Month." Initially, "Hispanic" may not have been the label of our choice. But now, tearing it off is impossible. (This column was originally published on July 21, 2004).